Despite opportunities to go fishing, and the rivers opening, I haven't been able to get motivated over the last week. The failure to catch eels has dampened my enthusiasm for that, and the rivers will be busy. Arriving at the canal last night reminded me of another factor putting me off. Pollen. I trudged a quarter of a mile through head high grasses to check out an area only to find it choked with weed for a good few yards from the bank. Not that there were any accesible swims. The stretch looks worth a shot, but it would need some work doing before fishing. So I trudged back whence I came and tried to find a fishable swim nearer the car. By now my eyes were itchy and my nose starting to stream. There was one swim that wasn't blocked by floating weed. 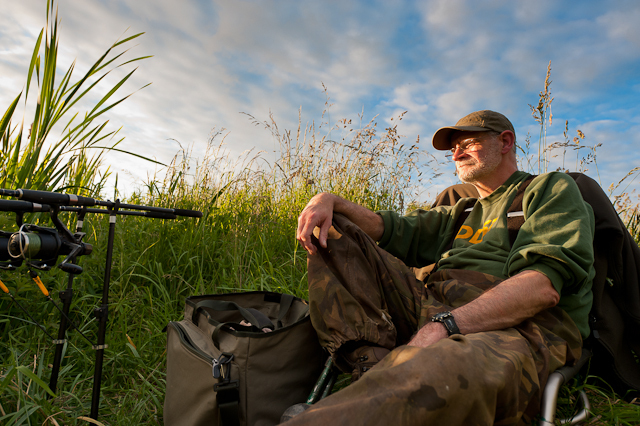 It was a comfy one to get the rods and chair in, and by angling the rods I could fish towards some cover. One bait to the far side and the other dropped just past the weed on the near shelf. The long lead link made positioning the far roach half easy. I sat back to sniff and rub my eyes. Then I remembered I'd forgotten to put a drink in my bag. As usual there was plenty of warbler activity. Reed warblers were using reed stems as launch pads to fly up and catch insects on the wing. Ducks were dabbling in the reed beds. Fish were topping, some noisily. I had a couple of quick bleeps on one alarm as a warbler brushed the braid as it flew past my swim. There was little breeze and as darkness fell it died to nothing. Clouds that reminded me of chub scales drifted slowly inland, lit salmon pink by the light of the set sun. I put my fleece on. I'd taken a pair of fleece mittens too this time. I got them out and took a while to work out why one wouldn't fit my right hand. I have two identical pairs and had picked up both left hand mittens. Ever ingenious I turned one inside-out and made a complete pair. Just as the light had faded to the point peering into the clear water revealed nothing a yellow lily bud moved under the rods as a fish brushed the stalk. A few seconds later the surface was disturbed among some floating grassy weed. I stood up to try and get a glimpse of whatever was making this gentle disturbance and the surface swirled again. Ever so slightly as from fin movement. It could have been anything. A pike working the margin, a tench or bream perhaps. I had a feeling it was a carp. There was something about the patterns the water made. Maybe seeing that koi the other week has got to me. Although it was going cooler the little cloud cover there was prevented a mist rising from the water. I was confident, but thirsty. At quarter to eleven, with some light still in the sky just a day or two from the solstice, the right hand bobbin clicked off the line and the alarm sounded. No run developed so I tightened back up and put the baitrunner on. Five minutes later the same alarm sounded as a few inches of line were taken. I tightened back up. I should have checked teh bait. When I came to pack up half an hour later all that remained of the roach head were the bony bits. I was surprised there had been no action on the close in bait, again. When I used to fish for eels here it produced. 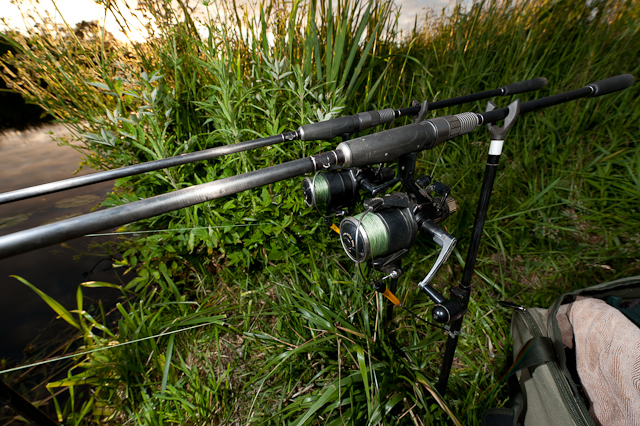 In fact I'd drop two baits in under the rod tops. With the weed getting thicker, and other places available, I think I'll give the eels on the canal a break (not that they need one from me!) and try for something else in another place. I need to get a bend in a rod soon.